Supreme Cattle Champion from G & E Jones. Seen here is (L to R) Judges Gwyn Edwards and Michael Alford, Mr & Mrs Jones, Meleri jones leading eye Catcher with sponsor Jonathan Guy of JG Animal Health with a cheque for £1000 and presenting cup is Society president John Edwards. The Jones’ run 20 pedigree Limousin cattle under the Trisant prefix alongside other livestock enterprises in mid Anglesey. “She’s homebred and was Reserve Heifer Champion at Builth this summer,” explained Meleri whom collected £1000 from sponsor Jonathan Guy of JG Animal Health. In the EWF’s sale of champions Eye Catcher saw an opening bid of £2000 before climbing steadily to £4000, under auctioneer Mark Elliott of Bagshaws. At this point Northallerton, North Yorks-based butcher Anthony Kitson raised the stakes pushing bids to a final £4400 to secure his second EWF Supreme Cattle Champion in as many years. Reserve Cattle Champion Berwyn Hughes still had a splendid show. His cache of trophies included Overall Pedigree Champion with the Limousin heifer Cwmlimo Harriet, Reserve Champion crossbred heifer sired by a British Blue called Siani, and - deservedly - the Champion Stockman’s prize (ahead of Peter Bodily of Abergavenny). Hot Buns' placing put Worcs-based Gilbert Brooke’s steer Flashy Boy in as Reserve Champion in the hotly contested Baby Beef competition. And there was more good news for Williams & Tippett when their champion entered the ring selling at £4500 to V & G Bowring of Manfield, Notts. Anyone who thought the Welsh couldn’t exert their might elsewhere were soon to be proved wrong. In the sheep championships - which this year saw a record entry of 150 pens of live sheep - first time exhibitor and Novice class winners Dafydd Lewis and Gethin Mathias of Llanwrda, Carms, led a pair of pure-bred Beltex ewe lambs to victory in the Blue Merle-sponsored Overall Sheep Championship taking on the might of more seasoned exhibitors. These went on to sell for £340/head later in the day to Staffs-based breeder Andrew Frogatt. Reserve Sheep Championship went to Herefordshire-based Robin Slade with his pair of Beltex lambs. These later sold for £500/head to Messrs Garth of Bentham, Lancs. And there was more Welsh supremacy in the Cattle Carcase classes sponsored by G & SJ Johnson Engineering as Michael Rowlands of Llanldloes, Powys, took both Champion and Reserve with a cross-bred Limousin heifer and steer, respectively. 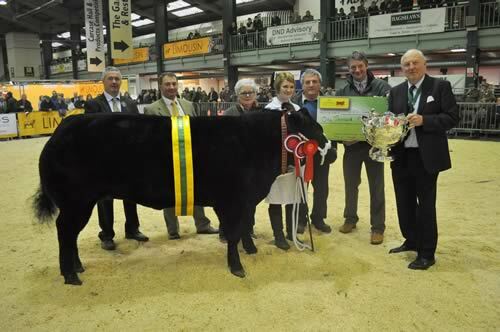 His second Champion Cattle Carcase title in two years, Mr Rowland’s heifer made £4.80/kg (£1826.40 gross) selling to retail and catering butcher Owen Taylor & Sons of Leabrook, Derbys, which purchased nine cattle carcases in total. His Reserve Champion made £4.60/kg (£1730.98 gross) selling to Bradshaw Bros of Chase Terrace, Staffs. Lamb carcase championship went to High Peak, Derbys-producers P Ritter and Son (£14.60/kg selling to butcher David Prince of Ashover, Derbys) with David Wadland of Aston le Walls, Northants, collecting Reserve Champion (£12.80/kg to the same buyer). And Welsh origins featured in the classes for live pigs. Pairs championship title went to a clearly delighted Tony Schofield of Market Rasen, Lincs, whom collected a British Pig Association award earlier in the month celebrating 25 years of breeding Welsh pigs. The pair later sold for £100/head to Leeds-based John Penny Meats. Single pig class was won by Mark Horsley of Skirpenbeck near York who saw his entry sell for £140/head to John Penny Meats. Mr Horsley also picked up Champion Pig Carcase title (£3.50/kg paid by David Prince) with Staffs-based J A Evans taking Reserve (£3.00/kg paid by John Penny Meats). With 300 cattle, 150 pens of lambs and a higher visitor footfall over the two-day event show chairman Ray Nield was delighted with the outcome. “Quality across all sections was tremendous. We must thank all exhibitors, sponsors and trade stands as without them we would not have a show of which to be so proud,” he said.